Australian yard Silver Yachts has opened up about its 85 metre in-build motor yacht project Silver Loft, which is taking shape in Perth. 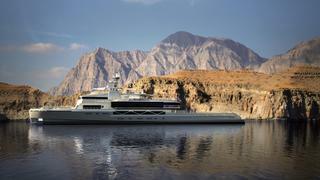 Developed in collaboration with designer Espen Øino, this all-aluminium cruiser is described by the yard as “a fast world explorer vessel with a genuine, fully-fledged superyacht finish”. Silver Yachts expects to splash Silver Loft in autumn 2018 but as the first in-build photo above shows, the hull and superstructure are already nearing completion. The team will now focus on the interior, which will be finished to a design by Andreas Hölnburger of Vain Interiors using teak and oak panelling, metallic painted features and oak and marble flooring. As the name might suggest, Silver Loft’s design is centred around a spectacular skylounge, which will measure 300 square metres and feature 3.75 metre high floor-to-ceiling windows for exceptional views out to sea. Al fresco relaxation is offered on the superyacht sundeck, with its 16-seat dining table, rotisserie barbecue, sunbeds and sunloungers. 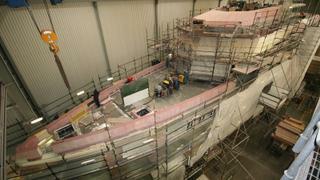 Meanwhile, the upper deck aft will be fitted with a Jacuzzi and yet more sunbeds. Silver Loft’s main deck aft has been designed as the superyacht helipad, with folding handrails and bulwarks so that a helicopter with a D value of 13 can be accommodated, for example an AW109. 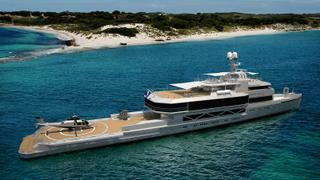 Meanwhile a 3,000-litre heli-fuel storage tank further enhances Silver Loft’s explorer yacht credentials. 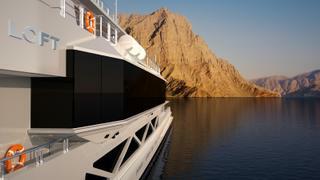 Accommodation is for up to 18 guests split between eight cabins, including an owner’s suite, three VIPs and four guest cabins, while 13 further cabins allow for a staff of up to 24 people. 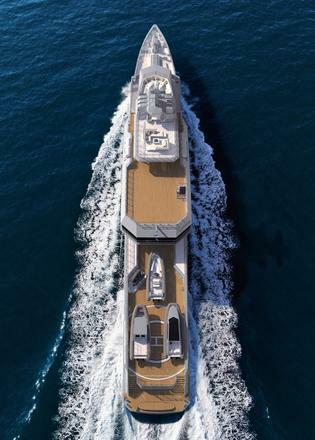 Full details of the propulsion system are undisclosed at this stage, but the yard claims that Silver Loft will boast a top speed of 24 knots and a range of 5,000 nautical miles when cruising at 18 knots.